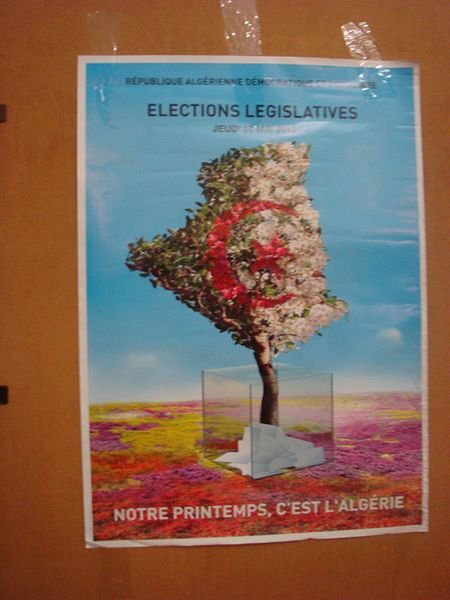 On Thursday 10 May 2012 national elections took place in Algeria with 44 parties and 186 independent candidates. It was the first electoral test since the Arab Spring and in the run up to the ballot the authorities did everything to ensure a high turnout. Through regular television adverts on state television backed up by a huge poster campaign and even mass texting, the message to ordinary Algerians was simple: voting was a citizen’s duty. In a letter to the Algerian General Workers Union the seventy-five year old President Abdelaziz Bouteflika called on citizens to recognise that the country is on, ‘the edge of a critical stage in its history, a stage that demands its citizens to mobilise to realise the objective of national renewal’. He singled out women in particular, asking them to go to the polls in order ‘to confirm their presence on the political stage and consolidate their participation in putting together a society of justice, tolerance and equality; as today’s conditions are ripe more than ever before for their hopes to be realised’. Then, just two days before, a frail-looking Bouteflika made an impassioned appeal to Algeria’s youth population in a public speech in the east of the country. Hailing the elections as a decisive test of Algeria’s programme of reform, the head of state talked of a generational crossroads: “I’m addressing the young people who must take over the baton because my generation has had its time. The country is in your hands. Take care of it.” In this way the contest was not one between the political parties. It was between those who were going to vote versus those who were not going to vote where the issue was legitimacy. In the interests of political credibility the authorities needed a respectable turnout. Bouteflika’s pleas went unheeded, however. Only 42.9 per cent out of 21 million electors voted. Admittedly this is an improvement on the 2007 elections when the turnout was just 35 per cent, the lowest in Algeria’s history. But such an abstention rate is still a damning verdict. It is a measure of the popular hostility to the political system. Large numbers did not vote because they saw the election as a charade. This sentiment was clear in countless blogs and posts on the internet. Again and again Algerians underlined their disgust with the political class. In their eyes the national assembly is a facade because the real power lies in the higher echelons of the military, known popularly by the French term ‘le pouvoir’ (the power). On this basis they could not see the point of voting. In the case of 34 year old Djalel H from Annaba, he told the French daily Le Monde that he was abstaining because: ‘I want something else, and I no longer have confidence in the system in place’. This disaffection was also clear in political graffiti. In some cases government posters telling people to vote were simply ripped down. In others they were defaced with the price of potatoes which has tripled over the last few months. Thus abstention must not be confused with de-politicisation. Not voting was a political act for large numbers of Algerians. The results themselves offered no surprises. They reaffirmed the political status-quo. The two winners were the parties of the ruling coalition, the Front de Libération Nationale (FLN) led by President Bouteflika and the Rassemblement National Démocratique (RND) led by the Prime Minister, Ahmed Ouyahia. Out of 462 seats they secured 208 and 68 respectively. Behind them the Green Alliance, uniting three Islamist parties, made little headway, only getting 49 seats when it had been expecting 65. While the oldest opposition party the Front des Forces Socialistes (FFS) won 27 and the Trotskyist Parti des Travailleurs (PT) gained 24. On the face of it, therefore, Algeria is going against the grain. In contrast to Egypt, Morocco and Tunisia, where elections have witnessed a ‘green wave ‘catapulting Islamist parties into power, in Algeria they remain on the sidelines. In part this is because by participating in the elections they are complicit with the system in the eyes of many Algerians; a feeling made worse by the fact that until recently these parties were part of the ruling coalition. In this sense the Green Alliance was not a clean pair of hands. It suffered from a generalised suspicion towards all political parties; a symptom of the way in which the January 1992 elections still casts a long shadow over Algerian society. At this point the Islamist party, the Front Islamique de Salut (FIS- Islamic Salvation Front) was poised to take power, but were stopped by an army coup d’état. Thereafter Algeria degenerated into a terrible cycle of violence and counter-violence between army hardliners and Islamist guerrilla groups. Elections were re-launched in 1995 with a presidential contest. However, the manner in which this democratic process has been controlled by the authorities has produced widespread cynicism. Many Algerian believe that the results are a foregone conclusion. Consequently they are circumspect about parties of any political ilk. They do not want to be manipulated. Externally Bouteflika needed the legitimacy of the international community. On this basis the country welcomed 500 electoral observers which gave the elections a measured stamp of approval. Their reactions ranged from the Arab League team, happy to describe them as free and transparent, to the EU team, led by José Ignacio Salafranca, who said that the election passed the credibility test, even if it listed irregularities. In Paris the French government noted that they took place ‘calmly and without major incident’, while in Washington Hillary Clinton made a statement of measured optimism. She welcomed the elections as a ‘step in Algeria’s progress towards democratic reform’, underlining that nearly a third of the deputies, some 145, were women. In contrast the opposition shouted fraud. One Green Alliance leader Bouguerra Soltani claimed that malpractices was widespread and condemned the results as ‘illogical, unreasonable and unacceptable’; a perspective that was corroborated to some extent by the EU team. It noted the addition of 4 million new names since 2007 that they not allowed to validate, leaving the suspicion this was a mechanism for massaging the figures. The elections repressive aspect was also very clear. When a young blogger Tarek Mameri posted a series of video clips on the internet telling people not to vote, he was arrested on 2 May and subsequently given an eight month suspended sentence. Such an attack on the freedom of speech did not deter the FLN general-secretary Abdelaziz Belkhadem from striking a triumphant note though. Brushing aside criticism, he called on the Islamists to accept the vote. And this reminds us that in the midst of the Arab Spring Algeria continues to be different. Unlike Egypt, Libya and Tunisia the status-quo remains in place. But, if Algeria seems out of step, the Algerian example still haunts the Arab World, namely the terrible consequences that followed the cancellation of elections in 1992. The memory of the Algerian option is one reason why the military in Egypt have allowed elections to run their course. There the immediate future is about the inclusion of Islamist parties in government. For the time being at least the military wishes to share power rather than embark upon anti-Islamist repression.